Nads' Bakery: Happy Valentine's Day!!! I just came back from watching the movie Valentine's Day with a bunch of friends and it's funny, it really didn't hit me that it was Valentine's Day until I watched it. The best part was Julia Roberts' line at the end after all the bloopers. It's nearly 2AM and Valentine's Day has come and gone. Even though I don't have a significant other to celebrate this Hallmark and Chocolate non-holiday I did have a beautiful Sunday. Good times with ones I care about and a couple of movies. I'm an easy one to please... all I need is good friends, good food, and a good movie (or even a semi-ok one to make fun of).. and I'm set. 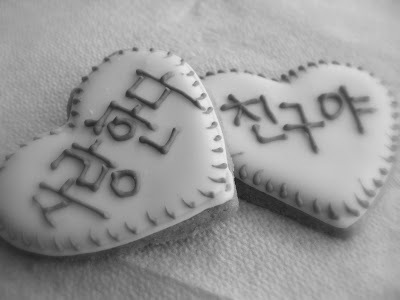 This says, "I love you" "Friend"
Those cookies are hilarious and awesome! Thanks!! Haha I know.. I get a good chuckle every time I look at them too!